● Print everything from home and school projects to business documents with the confidence in the end result: high-reoslution images and graphics. ● Variable size ink droplets as small as 3pL produce bright colors and precise images. 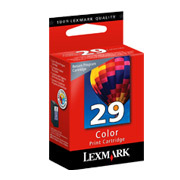 ●The #29 color cartridge reflects a $4 up-front discount** compared to alternative cartridges in exchange for agreeing to return the used cartridges only to Lexmark for remanufacturing or recycling. Page yields may vary based on factors such as machine model, media, print mode, print file type and print applications. ● Use Lexmark genuine ink and paper for best results! ● This high-resolution color cartridge uses Lexmark's exclusive dye-based inks. These inks, coupled with small drop sizes, produce vibrant color, clarity and detail for brilliant photos and sharp images. ** Discount reflects the difference between Lexmark‘s suggested street prices for the equivalent cartridges; actual cartridge prices and effective discount may vary based on reseller pricing and promotions. Up to 150 Standard Pages in accordance with ISO/IEC 24711.